I do love a beauty product or six. I picked up a Kiehl's serum a few years ago and was dismayed to find it discontinued when I returned to replace it. 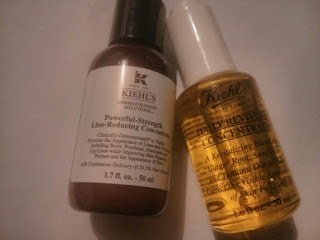 Last month I wandered past a Kiehl's after getting my hair cut; I was in a spendy mood so I went in to ask for a recommendation. The white-coated sales assistant held something to my skin and told me in hushed tones that it was very dry indeed. Of course it was. He recommended me a serum and then - because I was such a desperate case, presumably - a facial oil. I impulse-purchased both, then put them in the bag Mr Z was taking home from London because I was flying with hand luggage only, so they sat unloved for a week or two. I have been using them daily since, though, and they are very good. I should by rights be looking akin to a haggard, 90 year old witch with eye bags you could pack a lunch in, but, even though this is how I feel, my skin looks like I've just had a few weeks at a relaxation retreat with unlimited sleep. Magic. The serum feels a bit weird. It's a bit like plastic. That's probably the silicones. It does seem to have diminished the crow's feet after using it twice daily, though. I'm afraid now I'm getting old that I need to be less picky about ingredients. That said, I did prefer the acai one I got back in 2011; I got a sample of the midnight one and think I might prefer that, too. Maybe for Christmas. The facial oil is delightful. It smells of oranges. It is possibly even better than the Neal's Yard one I love, mainly because it has a plunger to fill the pipette instead of a squeezy - that squeezy split in my washbag during the summer holiday and the entire bottle of Neal's Yard stuff is now moisturising said washbag. Old white coat was insistent that the oil was quick absorbing an not at all greasy. I wouldn't quite agree; I wouldn't put it on in the morning. But it does feel quite light and Mr Z is slightly less annoyed when he kisses me goodnight and ends up with a lipful of it than he was with the Neal's Yard oil.